NGARI AND DENMA KHANGTSEN TOGETHER OFFERED LONG-LIFE PRAYER TO KHENSUR RINPOCHE. On the auspicious day of 9th Feb, 2011, Ngari and Denma Khangtsen together offered the Long Life Puja to Khensur Rinpoche Jampa Theckchok to request him to remain long and healthy life for the welfare and prosperity of all. The interior and exterior Prayer Hall of Khangtsen was nicely decorated with the colorful religious articles, multicolor-fresh flower malas and the fragrance aromatic herbal incenses filled the hall. The purification of surrounding and the 8 traditional auspicious symbols was drawn on the ground for the welcome ceremony to Khensur Rinpoche for his Long Life Puja. The actual long life prayer congregation was held on 9th Feb, at Ngari Khangtsen’s prayer hall with great devotions. Venerable Denma Tengye Rinpoche (Former Abbot of Tawang Monastery) presided over it. The current Khenrinpoche of Sera Jey Ven Lobsang Palden and the administrators, Dzonchoe Khenrinpoche and the administrators, and representatives from Denma, Hadong, Sermey Tsador, Lhopa Khangtsen, Geshe Gedun Choephel la, Geshe Thupten Rinchen la offered Mandal and traditional scarves to Khensur Rinpoche followed by tea, bread and money offerings to all the participants. Many senior Geshes and general monks of both Khangtsen offered prayer with great devotional chants for hi Long Life. The puja was concluded with grand successes. OUR WARM WELCOME TO VEN KHENSUR RINPOCHE JAMPA THEKCHOK AND HIS NEW SAPLINGS PLANTING INITIATIVE. Our most reverend Khensur Rinpoche Jampa Theckchok and his chief student Ven Steve Carlier ( Thubten Sherab) visited the Khangtsen on 17th January, 2011 after the His Holiness the Dalai Lama’s teachings in Varanasi-2011. He really enjoyed his brief stay at his New Residence at Khangsten’s building project site and was obviously impressed and fascinated by the peaceful environment, fresh air and spacious area of the Khangtsen. A few days after his arrival, Khensur Rinpoche began to plant new fruits-bearings saplings in the premise to encourage the monks of Khangtsen the importance of healthy environment, and how it that leads to healthy minds and society. Ven Bodong Rinpoche, Geshe Tsewang, Geshe Sangye, Geshe Palden and the senior geshes blessed the new saplings and the students joined them in planting saplings in order to make it a Green Zone or Zone of Ahimsa where monks can study and practice in lush green surroundings in future. We are indeed very much indebted to Khenur Rinpoche for his all his spiritual guidance and wholesome advice and his immeasurable kindness for the growth and the progress of Ngari Khangtsen in every aspects. Our hearty thanks go to Ven Steve Carlier for his continued financial support and kindness shown to us. Along with the planting of saplings, interlocking bricks for foot-path are being laid. Geshe Palden and Tenzin Lekshe are overseeing the laying of it. VEN KHENTRUL RINPOCHE (The Professor) AND MRS LENA LIU VISITS & A LONG-LIFE PUJA OFFERED AT KHANGTSEN.Venerable Khentrul Rinpoche, Mrs Lena Liu and the students of Rinpoche visited our Ngari Khangsten on the 25th January 2011.The current Ven Khentrul Rinpoche is the reincarnation of the Former Abbot of Sera Je Samlo Khenpo Lobsang Tender, from Mongolia. He was a distinguished scholar and acclaimed Buddhist master in the Buddhist philosophical field and practices. A Long Life Prayer for Khentrul Rinpoche was held at Khangtsen’s prayer hall. The monks Ngari Khangtsen and the students of Rinpoche together prayed for his Long-life and elimination of all the obstacles on his secular and spiritual endeavors in life. 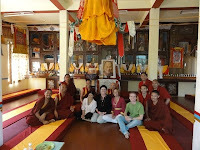 At the dawn of 2011, our long-time Dharma friends and supporters from Sweden Mrs Denise Vestin( Our Webmaster ), Mrs Ingrid and Yuonne, Pearl Mellskit visited us at Sera Jey Khangtsen ( Sera Ngari Education Society) after the Kagyud Great Prayer Festival ( Kagyud Monlam Chemo) at Bodh-gaya in Bihar. They visited our newly built monks’ hostel and our old ones too, and were impressed by a little progress we made in building project. We are very much indebted for their continued kindness and supports donations, cooperation and coordination in the materialization of our projects through the computer network or web site which was entirely designed by Mrs Denise Vestine and her friends. 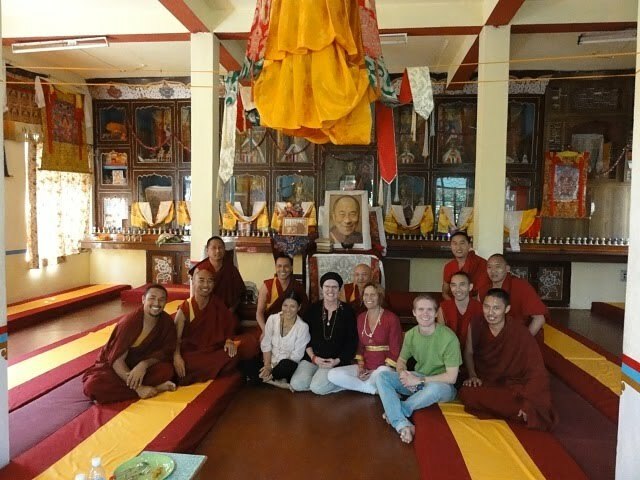 Mrs Denise Vestine and the group enjoyed the brief stays in Sera, meetings with the Geshe Palden and Tashi (Administrative), Khangsten Gen La, Geshe Ngawang Sangye, Tsewang , Tenzin and the children of Ngari Khangsten.